aDesigner is a visually impaired software simulator developed by Chieko Asakawa and IBM Research Tokyo. The software helps designers ensure that their content and applications are accessible and usable by the visually impaired. Voice browsers and screen readers read aloud the text on Web pages and are used by visually impaired people. However, these devices are less effective with certain kinds of content, such as highly graphical material. Web developers can use aDesigner to test the accessibility and usability of Web pages for low-vision and blind people. 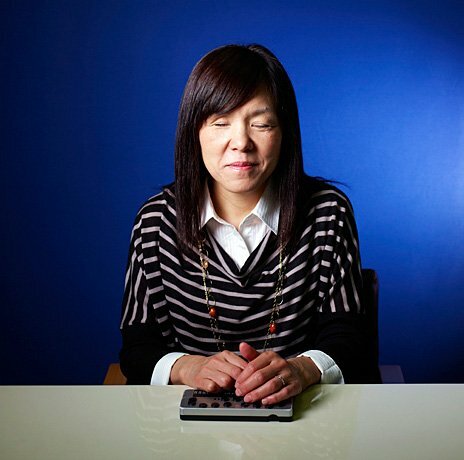 As visual user interface and multimedia content have become increasingly popular on the Internet, Chieko has been working on finding ways for visually impaired people to enjoy the benefits of these advances. Chieko and her team have developed a number of pioneering technologies, including a disability simulator called aDesigner, which helps Web designers identify potential design issues to make their websites more user-friendly to all; a tool called aiBrowser, which for the first time helps visually impaired users to access streaming video, animation and other visual online content. And Chieko and teams in IBM developed the Accessibility Tools Framework, which offers standardized design and application programming interfaces, allowing developers to create accessibility tools and applications easily and cost effectively. Contribution of these technologies and the framework to the open source community, Eclipse Foundation, may help stimulate assistive software innovation to advance Web 2.0 content accessibility. Since summer 2008, Chieko has led the Social Accessibility project. Based on collaboration software developed by her team, it creates an open, collaborative environment where blind users, developers and sighted “supporters” work together to solve real life Web accessibility issues raised by blind users. A variety of accessibility technologies that her team developed, as well as findings gained through the project, are part of the innovative accessibility improvement solution that IBM offers today. To explore ways to design a multimodal interface on mobile devices for use by the elderly, semiliterate or illiterate people and individuals with limited or no access to information technology, Chieko initiated an Open Collaboration Research project in 2010 with IBM researchers in India and Japan as well as with universities in India and Japan.